Your thyroid is a butterfly-shaped gland that sits near your vocal cords and produces the T3 and T4 hormones that control your metabolism. To make these hormones, your body uses iodine -- about 80 percent of the iodine you consume is used by your thyroid. If your diet is deficient in iodine, or you have an underactive thyroid, known as hypothyroidism, eating raw cruciferous vegetables such as cabbage can further suppress your thyroid hormone function. Your thyroid produces two distinct hormones, T3 and T4, which regulate the rate your body uses energy and oxygen, which are the two components of your metabolism. If your thyroid doesn't produce enough hormones, your metabolism slows, leading to weight gain, slower heart rate and an increased sensitivity to cold. The most common cause of hypothyroidism is an autoimmune disorder, but an iodine deficiency can also slow thyroid hormone production. Iodine deficiencies are rare in the United States because salt is iodized specifically to prevent hypothyroidism. A goiter is an enlarged thyroid gland that indicates hypothyroidism. A goitrogenic food contains a substance that can affect your thyroid, slowing hormone production. Cruciferous vegetables all contain goitrogens. 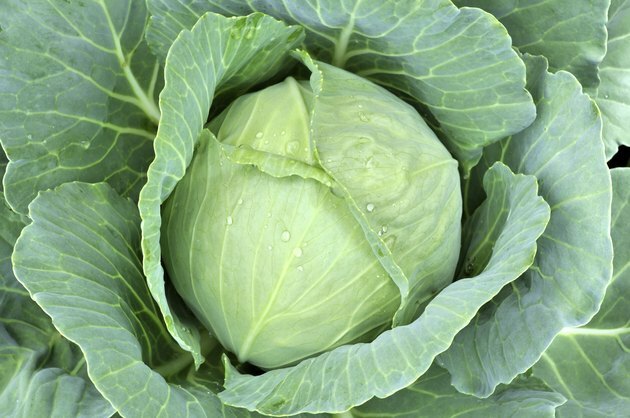 These include all types of cabbages, such as napa cabbage, bok choy and Brussels sprouts; broccoli, cauliflower and kale; and collard, mustard and turnip greens. If you have normal thyroid function and consume adequate amounts of iodine, these compounds will have no effect on your thyroid. The Institute of Medicine has established the recommended dietary allowance, or RDA, for iodine at 150 mcg daily. One tsp. of table salt contains 400 mcg of iodine. Fortunately, the goitrogenic compounds in cruciferous vegetables are destroyed by heat. Cooking these vegetables will ensure that they will not affect your thyroid. There are different types of goitrogens; the ones in raw cabbage and other cruciferous vegetables are isothiocyanates, which block the enzyme that allows your thyroid to use iodine. Other foods that contain goitrogens are soy, spinach, strawberries, peaches and peanuts. Fermenting soy disables the goitrogenic isoflavones found in soy foods. Also, you can limit your consumption of certain foods to avoid the goitrogenic effect. In developing nations, iodine deficiency is the leading cause of hypothyroidism. In the 1920s, iodine was added to salt in the United States to prevent thyroid problems. If you're following a low-sodium diet, other food sources of iodine include saltwater fish, shellfish, seaweed, eggs, cheese, ice cream, yogurt, milk, bread and soy sauce. You can also take a daily multivitamin to ensure proper iodine intake. Both too little and too much iodine can create thyroid problems. In rare cases, an increased iodine intake can lead to hyperthyroidism -- an overactive thyroid.